Die grinders are among the handiest and most versatile tools available. You can use them to remove paint and rust, clean welds, polish stainless steel, enlarge holes, and port and polish. Air-powered die grinders are light and compact—made to perform precise cutting and shaping tasks in confined and hard-to-reach areas. Unlike electric die grinders, pneumatic die grinders can’t burn out. They do consume a lot of air, though—usually between 10 and 20 cubic feet per minute (cfm). For improved efficiency, look for higher quality die grinders. They use less air and often deliver smoother operation and more power. At KMS Tools, we have an unbeatable selection of pneumatic die grinders, from top-of-the-line die grinders designed for everyday professional use to budget-friendly tools for that occasional job. 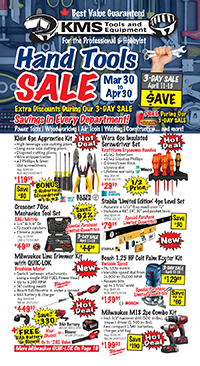 Stop by kmstools.com, check out our monthly flyer or a location near you and find an incredible sale price on your next die grinder. With its innovative and ergonomic pistol grip, the Chicago Pneumatic CP9107 delivers one-handed control and improved operator comfort over a long work day. With a lightweight composite housing, the 308B insulates your hand from the cold compressed air blasting through the handle. This die grinder is powerful, fast (25,000 rpm) and comfortable to operate. Super compact and comfortable, the 31020 fits in your palm and cranks out up to 0.25 hp. Pretty impressive numbers for a little guy. The Master Palm Mini 38030 1/4″ angle die grinder is also available. 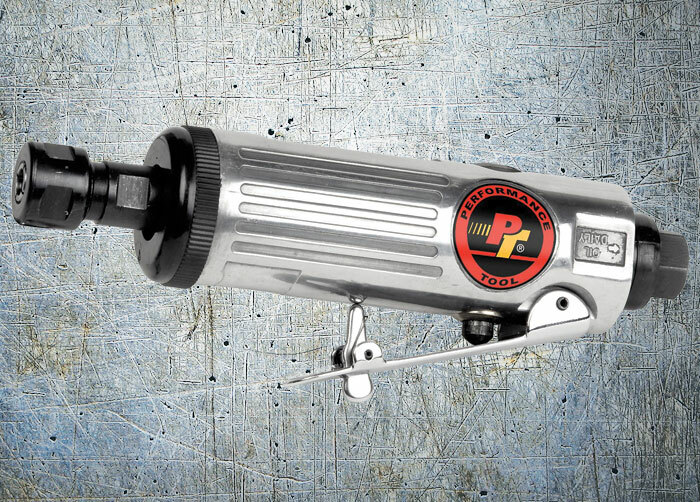 This 1/4″ straight die grinder features a composite handle and includes an eight-piece carbide burr set, offering great value for a medium-duty tool. The M566DB is an economical solution for sanding, grinding, polishing and more. A die grinder uses a collet (often 1/4″) to secure various attachments. These include mounted points, wire cups and wheels, rotary burrs, rasps, sanding pads, flap discs and cut-off wheels. Compressed air powers the die grinder’s motor, and you can adjust the motor’s speed with an on-board regulator. Most die grinders spin between 17,000 – 30,000 rpm without a load. Because they are compatible with so many accessories, die grinders are popular with automotive repair and maintenance technicians, autobody professionals, welders and fabricators, and even furniture makers and woodcarvers. Pneumatic die grinders are available as either straight or angled. Most automotive shops have one of each. Straight die grinders turn at higher speeds and are great for porting manifolds and cylinder heads. Angled die grinders are excellent for polishing, sanding and grinding welds, and they can operate in areas that your sander or electric angle grinder can’t access. 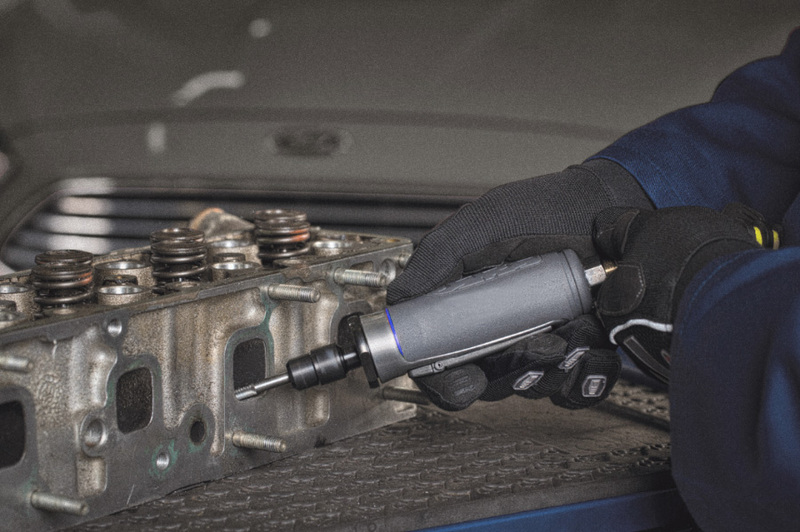 The latest die grinders, like this pistol-grip CP9107, feature upgraded ergonomics that make them more comfortable and easier to use over long periods of time. As mentioned earlier, die grinders can spin a number of attachments, and this makes them useful for many projects. See the chart below to find the right attachment for your project. This entry was posted in Air Tools, Archives and tagged air tools by Your Friends in the Tool Business. Bookmark the permalink.